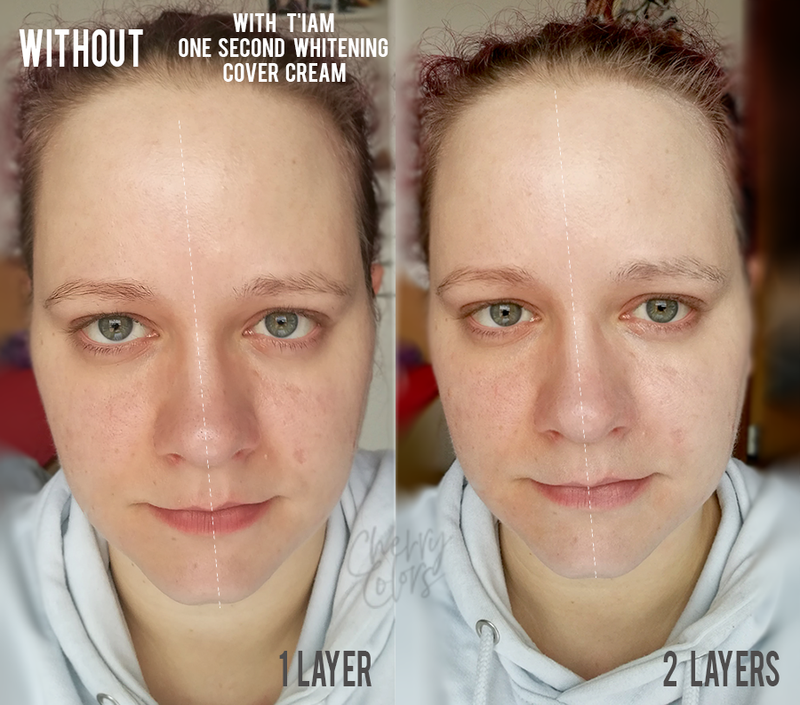 [JOLSE] TIA'M One Second Whitening Cover Cream - Cherry Colors - Cosmetics Heaven! I received from Jolse a product that I've never thought I'd try. It's a whitening cream that is supposed to add luminosity to your skin and thus hiding its imperfections. Let's see how it did on my skin! Does your skin need a boost? 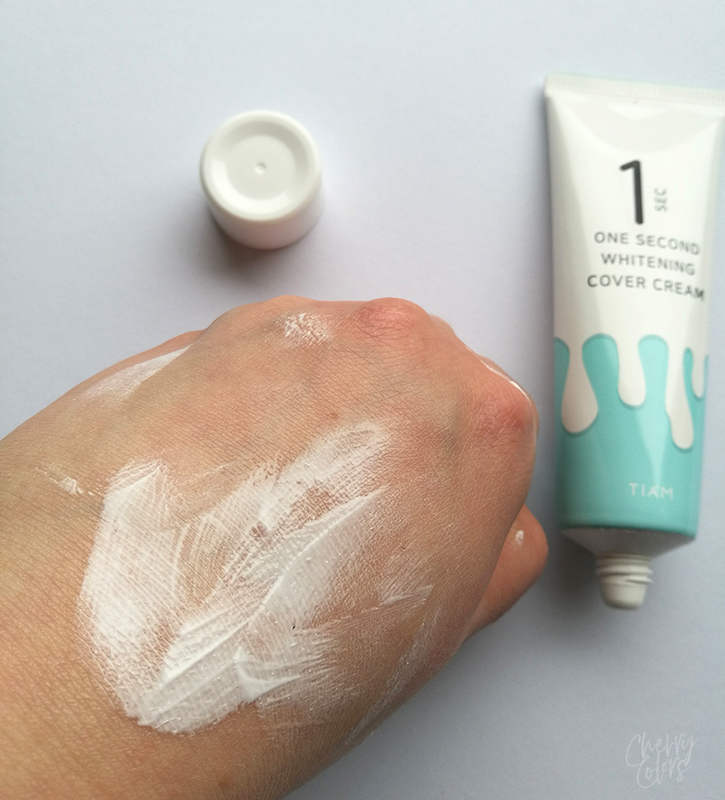 Meet Tia'm's One Second Whitening Cover Cream! This cream will leave your skin looking dewy as it works to moisture dry skin and soothe irritated skin. Its special sebum control formula also keeps skin from becoming too oily. Achieve a flawless canvas for your makeup! The cream comes in double packaging - the cardboard box that has all the information written on it (in English too!) and the plastic squeeze tube. The tube is made from soft plastic so squeezing it isn't a problem. Because the plastic is quite sturdy it should survive traveling. The cream is very light and completely white. It has a light citrusy scent that isn't very noticeable and vanishes a couple of minutes after application. 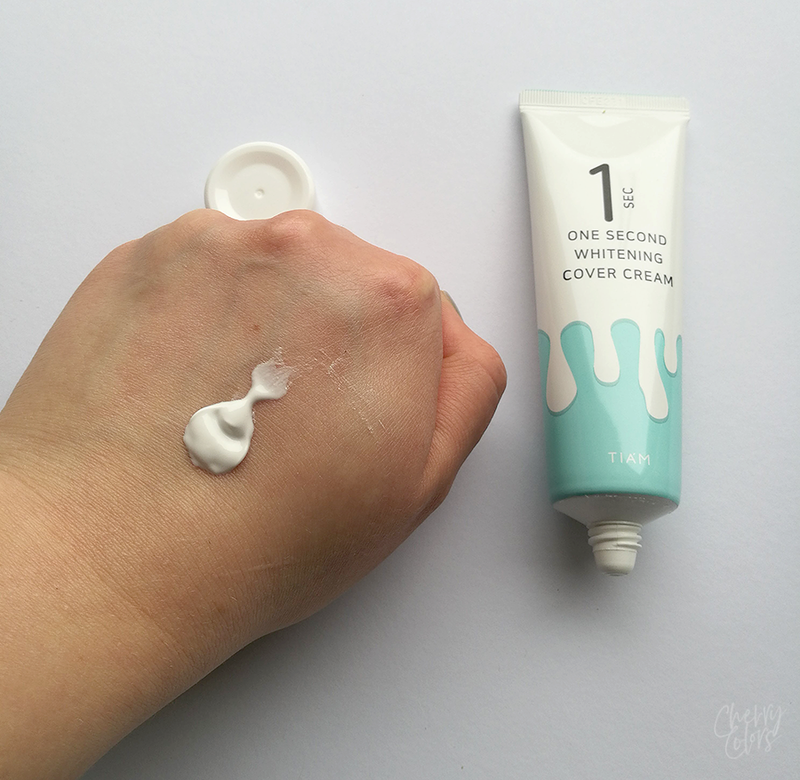 Once you squeeze it out of the tube it feels more like a gel than a classic cream. I think it's because of the high water %. Once you start spreading the cream, well that's when things start to get weird. Why weird? Well, I'm glad you asked. 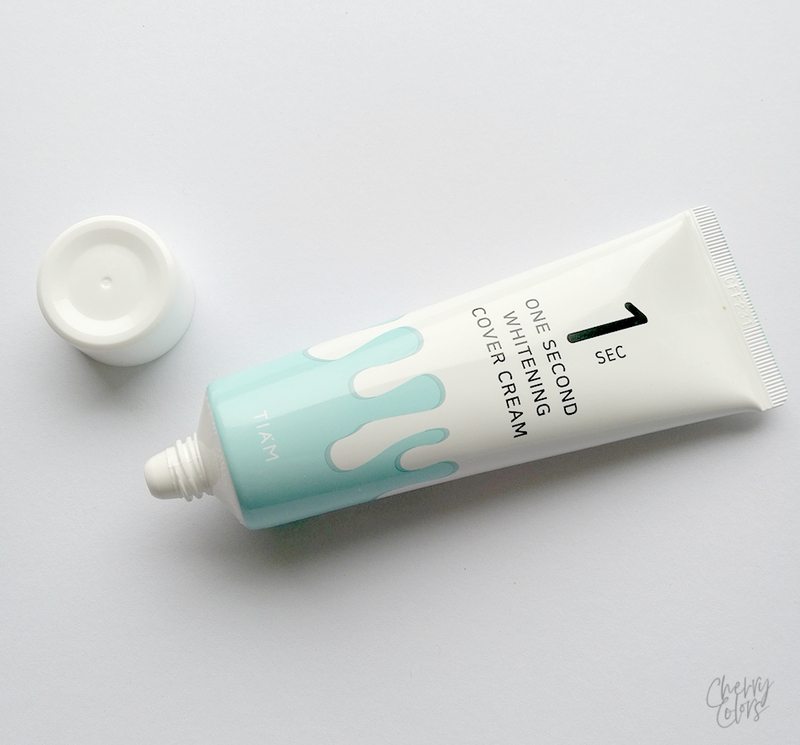 Some parts of the cream just cling to the skin while other parts feel like water. So it's like you're trying to spread a cream with a high percentage of oil while you're running your hands under water. And while you're rubbing the cream you can see water droplets forming. Because of that need to rub it in quite vigorously (if you apply too much of it which you shouldn't). And if you're too slow, well too bad. Now you're left with white dots covering your pores. But because they recommend using it sparingly - thus layering it if you want a whiter effect, you should be fine. Use as the last step of skincare routine. Apply appropriate amount and pat your skin until absorbed. To achieve a brighter complexion, reapply. Here I used way too much of the cream. Way too much. 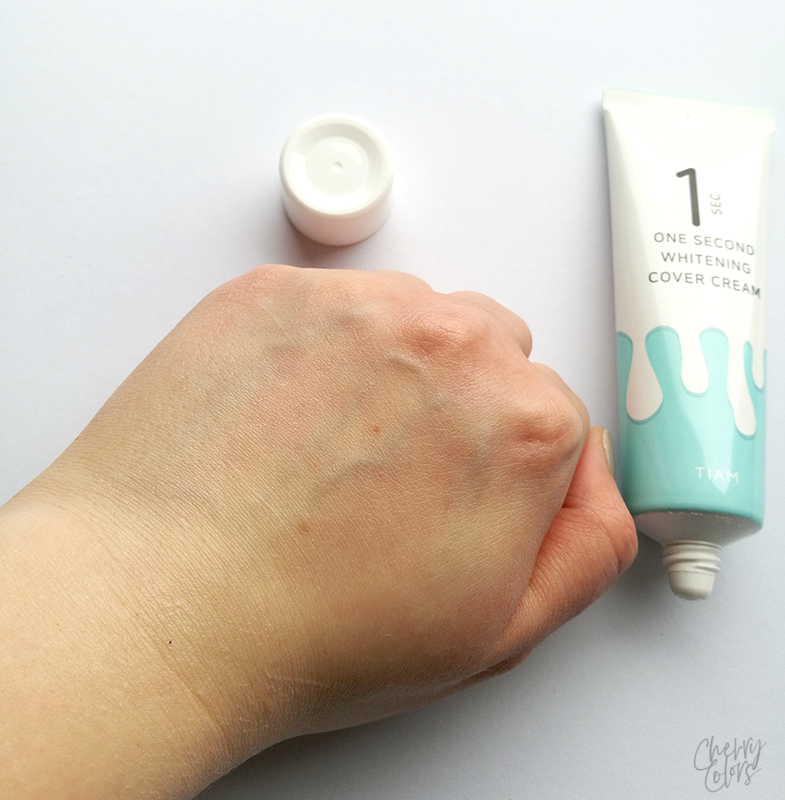 And because I'm not used to patting the cream while applying it ... it took me about 5 minutes to get an even coverage. On the picture, you can see what I meant with the "Some parts of the cream just cling to the skin while other parts feel like water". I know you've been waiting for this part. Since I am pretty pale (pail if you're looking for a jerk), the cream didn't do a lot for me. I mean, I did notice my skin looking prettier and brighter after application but on the picture, it's hard to notice. 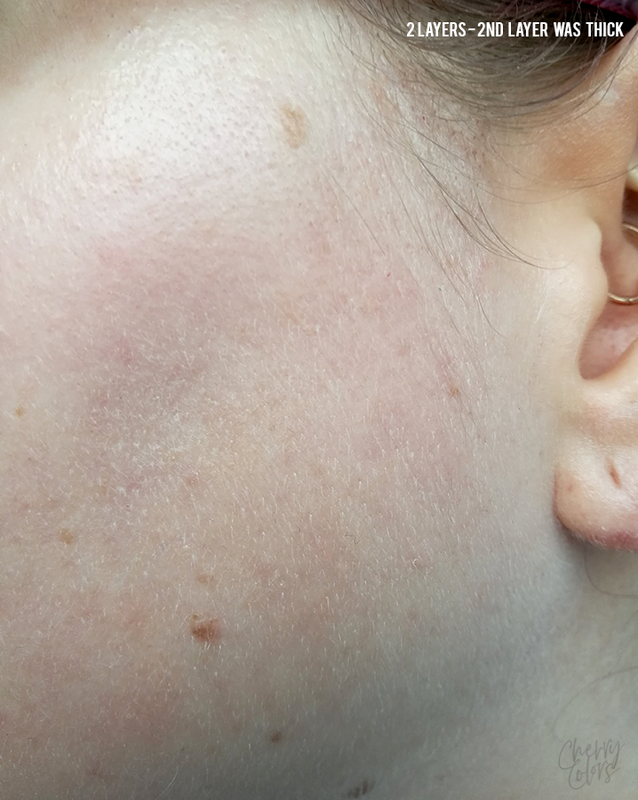 My skin is currently breaking out (lots of lovely red dots all around it) and it actually looked so much better after I applied the cream. Like the light reflected the attention from the red marks. Can you see the white dots? That's the cream! I read that it works well with foundation and that's something I still have to try because I am wondering if it could improve the formulation of some of the heavier ones. Luckily the cream feels lovely. After application my skin is luminous (has a glow), when I touch it my skin feels super smooth (because of all the silicones in it). + it works (lightens the skin)! 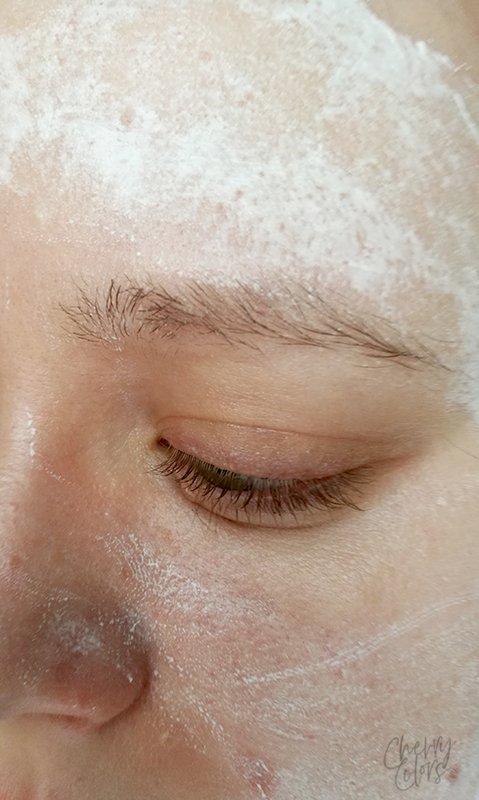 - if you apply a layer that's too thick you get white pores! I was excited when I read what the cream promises - whiter skin with some interesting ingredients. I was practically sold on the mention of Niacinamide because that's a known ingredient that helps with skin restoration and anti-age. But at the same time, the cream is full of silicones and my skin isn't a fan of these. Luckily it didn't break me out but I'm still worried that it might do just that. Overall it does what it promises - whitens the skin in seconds. It's practically a white foundation/mask that lasts for as long as it's applied. It's not a miracle cream that will lighten your skin on the long run, but it's something you'd wear if you'd want to cover up the redness of your skin or maybe your tan (if you're into that). I don't think I'm the target audience for this product but I will use to mix with my foundations as some of them are a tad too dark. Let me know what you think about the formulations that are just a bit of a hassle to work with, in the comments below.